A new study has found that breast milk from women who use a breast pump to express milk is poorer in beneficial bacteria and contains more potential pathogens than milk from women who only breastfeed. The researchers say this was revealed in what they are saying is likely the largest study of human breast milk to date. The study revealed that this change in the breast milk microbiome was detectable in mothers who pumped even as infrequently as once once every two weeks. Previous research has shown the complex community of bacteria in a mother's breast milk is the strongest factor influencing the establishment of an infant's gut microbiota. The health of this bacterial ecosystem in the gut has been linked to a predisposition to chronic diseases such as asthma, allergies, and obesity. "This research was part of the larger child study which involves 3,500 families across Canada," said Dr. Meghan Azad, a research scientist at the Children's Hospital Research Institute of Manitoba and an assistant professor in pediatrics and child health at the University of Manitoba, in conversation with Quirks & Quarks host Bob McDonald. "We've been following the moms and their babies as they grow up. And in this particular study we were interested in the breast milk." They obtained breast milk samples from 393 healthy mothers in the study when their infants were three to four months old. Early in the study they found a large variation in the makeup of the bacteria in the breast milk. To understand why, they analyzed different factors such as the mother's body mass index, whether she delivered by cesarean section, mode of feeding, and if she had previous babies. "The one factor that kept jumping out at us when we used different ways of analyzing the data was the method of feeding," said Azad. 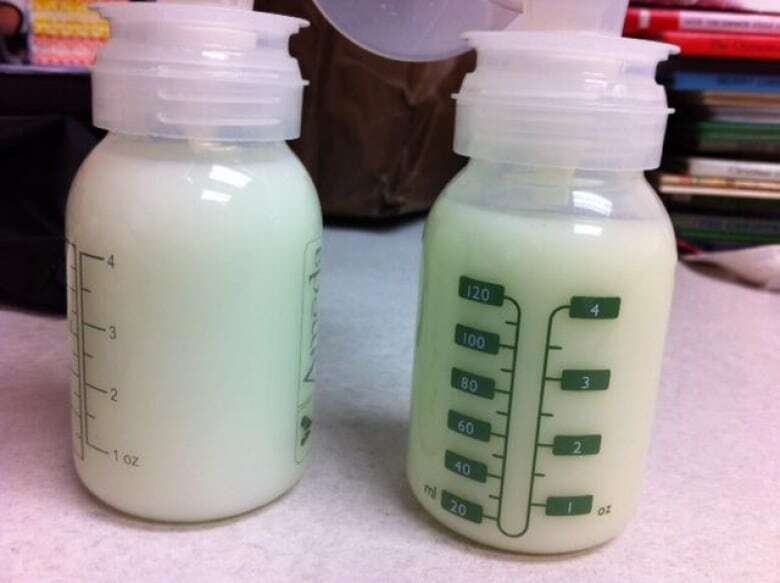 "We saw that the composition of the bacteria in the milk was different in the two groups of moms who either nursed directly at the breast or used a pump to express their milk." Azad and her team carried out bacterial gene sequencing of the milk samples to determine which bacteria were present in the milk. A family of bacteria known to be beneficial for babies when present in their gut microbiome — bifidobacteria — was found to be more abundant in the milk of moms who exclusively fed at the breast than those who pumped. And in the milk of pumping moms, the scientists found higher levels of potential opportunistic pathogens such as Stenotrophomonas and Pseudomonadaceae. "This doesn't mean that they're necessarily going to make the baby sick," said Azad. "But under the right conditions, they have the potential to do that." According to Azad, it's possible the potential pathogenic bacteria are living on the pump apparatus if the pumps are not being cleaned properly. It's also possible that pathogens just have more of a chance to grow in the absence of the beneficial bifidobacteria. But she says the findings from this study provide an important clue for an ongoing debate about where the bacteria that gets into a mother's breast milk comes from. One theory is the bacteria migrate from the gut into a mother's mammary glands, and then into the milk. The other theory is the bacteria in a mother's milk come from the outside. "When a baby is feeding at the breast, there's actually some backwash that occurs. And so some of the oral bacteria from the baby may be getting into the mammary gland and colonizing the milk," said Azad. As part of the larger child study, Azad said they had previously discovered a difference in the health outcomes in the children who were breastfed directly versus indirectly. "We saw that babies who were exclusively fed at the breast had the lowest rates of asthma by three years of age. And babies who are fed formula had the highest rates of asthma. And now in between that was babies who were getting breast milk, but some of it pumped in in a bottle," said Azad. So she says breast milk — even if it's pumped — is still the best food for babies. "Any breast milk is better than none — whatever way you can deliver it. But what I think what these studies are showing is that we shouldn't assume that all breast milk is the same when it's delivered in a bottle or at the breast."